My wife gave birth on Sunday morning to a little boy at 3.40am. I’m not sure exactly how to write about what happened. It did not go as planned. And I don’t mean in that we didn’t stick to the birth plan or something went a bit wrong during the delivery. I mean nothing went as planned. Let’s start at the beginning of the week. Bethend has been leaking fluid since week 32 at least and had low amniotic fluid for the last few weeks. On Tuesday she thought her waters had broken and the contractions were pretty regular – every two minutes – so we went into the hospital and she was examined. One centimetre dilated, waters not broken, baby not coming. The next few days were the same, contractions started around eight and got close and lasted all night. They tapered off in the morning and were mostly gone or every now and then. This happened all week. My in-laws arrived on Friday evening from America and we spent Saturday in town in the sun, with my sister and the kids. Bethend had contractions all day and really struggled to walk around. We got home, chilled out, had dinner and she went to bed having some sharper contractions and I went to watch my neighbours television kids for a bit while one went to pick the other up. When I got back the contractions were worse we called the ward and just as she sat up to make the call her waters broke. No doubt about it this time, they broke. We trekked up to the hospital again, bethend was examined again and yes her waters were broken but now she wasn’t in established labour. She was still only one centimetre. The midwife said we should go home. We didn’t have to, but there are more distractions from the pain at home. She could have a bath, a bagel…a baby. I regret letting her go home but I will make my peace with it. 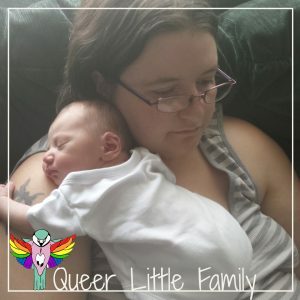 If the midwife thought it was fine, how was I supposed to know any different? We went home. I ran bethend a bath, made some tea, set up her laptop in the bathroom and sat with her to watch some Olympic weightlifting while she had contractions. Bad ones. That involved screaming. I hated seeing her in pain, especially when there was nothing I could do to stop or lessen the pain. Seeing her distressed breaks my heart. I thought I might be able to handle it after the accident last year but it was harder than I thought. She screamed. Actually screamed. I encouraged it but I still didn’t like it. After a while, it was getting worse and she was tired and disorientated. So I said, we’ll give ten minutes and I’ll call the ward. I didn’t get ten minutes. We drained the bath tub and I tried to get her out the bath but she couldn’t manage it so I called the ward. She managed to get on her knees in the tub and I tried explaining to the midwife at the ward what was happening. She told me to call an ambulance. They were great. A woman called Hannah asked me a bunch of questions, telling me she was going to tell me exactly what to do. She asked me if I could see any of the baby and I couldn’t at that point until bethend moved again. I could see his head and Hannah went to tell me what to do. Then there he was, bethend was catching him and I was yelling down the phone and saying ‘oh my god’ a lot. 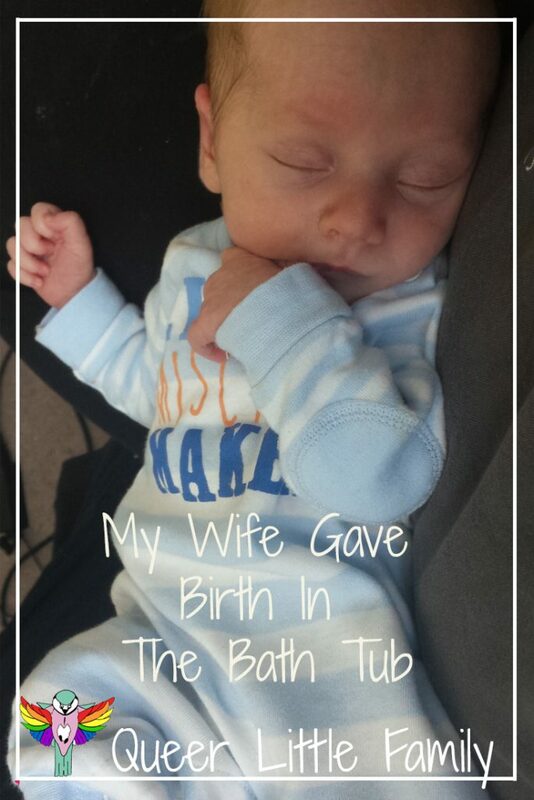 My son was born in a bathtub. She talked me through what to do, told me to wipe his airways and sit with her and watch her. He cried immediately, just needed to wipe him other while bethend held him. To keep telling her what was going on and for me, this was the worst bit. My wife was bleeding so much. She was so calm, holding him in her arms and shushing him and bleeding. Later she told me she knew he was fine but thought she was in trouble but part of her didn’t care because our baby was okay. I was freaking out because I could lose her, could lose my son and my wife and I love them. She is the only person I would ever want to do this with. While we were waiting for the ambulance I kept trying to do things before stopping because I knew I had to stay with her. With them. I went to change my trousers at one point, and get something else before remembering I needed to keep an eye on my wife and son. At one point I decided to sit down on the litter box – a plastic box. I weigh like 16 stone. It broke and I fell to the floor. And I was already freaking out and crying at this point because ‘oh my god my son was just born and there is so much blood’. Then my cat attacked me. At first I thought I had gotten some of the broken plastic in my leg, then it happened again and when I looked back Merry was behind me and hissing at me. She was freaking out because everything had just gone insane. The other cats were hiding and I shooed Merry away and she went and hid too. That all happened in about ten minutes and then the ambulance turned up with two guys and an emergency delivery kit (I still have a list of contents and the blanket from the kit). They came in, had me get more towels and blankets, clamped the umbilical cord before cutting it and handing me my son for the first time. I cradled him wrapped in a penguin towel – one of the few left in my cupboard and hovered in the hallway while they helped my wife (still bleeding) out of the bath and I tried not to get in the way (and failing) or freak out again (mostly successful). They got her into bed and did some checks – blood pressure and the like – while we waited for the midwife and bethend started shivering. She was going into shock so we got her more blankets and she held Snappy for a bit while we waited. They were really good guys and calmed both down, talking about normal stuff like what we were going to call the baby and if it was our first and where bethend is from. Things like that. I made sure the cats were all still accounted for while they had been coming in, counted four hiding cats and went back into the bedroom and stand next to my wife and watch her and Snappy just existing. Twenty minutes later the midwife turned up. Our midwife Amy – who did our birth plan (boy did that go out the window) arrived and couldn’t believe what had happened. She said as soon as she heard there was an emergency at home birth she knew it was us. We’re that kind of couple. She checked my little podge over before checking on bethend. It had been an hour at this point and she hadn’t delivered the afterbirth. While I was hovering and holding Snappy she helped her do so by effectively pushing on her stomach and pulling. This is literally the grossest thing I have seen in my life. The afterbirth was actually the same size as Snappy. I don’t know if that’s normal, it certainly didn’t look it and I do have to wonder how we survived this long as a species. Everything was fine, though, once we reminded Amy we did not want to keep it in any shape or form. It sat in a pan in my hallway though for the next twenty minutes, though. Existing and being gross. At some point, I called my in-laws. Not really knowing how to explain what the hell had just happened I just kept saying ‘he’s here‘ and my mother in law, after asking where just kept saying wow. It turned out my wife needed stitches cause going from one centimetre to ten centimetres dilated in a couple of hours will do that to you. We trekked up to the hospital in the ambulance, midwife behind us, in-laws en route cause they had all our bags for the hospital and went into a delivery room two hours too late. The midwife who had sent us home was still on shift when we got there. She was amazed and still trying to figure out what she’d missed. Nothing really, apparently it happens. Our in-laws turned up with all our bags and met their first grandchild while we waited for a doctor to come and stitch up my wife. A lovely doctor did the job and my wife finally got some pain relief while she did so and my in-laws waited in the family room and I just sat there holding my son. We spent a few hours in the hospital then before we could go home again. We needed to make sure bethend was okay and she wanted to make sure she could breastfeed Snappy before we left. He was weighed – he’s five pounds nine ounces – and checked over by the doctor who was happy with him. I think we dozed for half an hour while he slept in the fish tank cot and I managed to get hold of my mum, my dad, and my sister. Fire off a few texts, take a few pictures, call my in-laws again to come get us. We ate too. Biscuits we’d packed and toast from the kitchen. I posted his picture on facebook. Bethend took a shower. I held my son some more. We went home that day, around lunch time. Amy told us she’d be over the day after and my in-laws drove us home. My neighbours had fed my cats (and caught Mr. Brown who’d done a runner but he’s not very bright and never goes far). I had told them not to go passed the kitchen because it looked like something out of a horror film. No exaggeration on my part. We came home and I cleaned up the placed and started some laundry (salt gets blood out of most things by the way) and then we went to bed. I slept. Bethend didn’t. We spent the rest of the day in a shell-shocked stupor until my in-laws brought dinner over. That was Sunday. 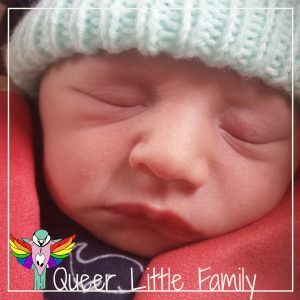 It’s Thursday now and nothing fits him, he’s met his aunt and his cousins, his neighbours and his nanna, being held and kissed and fed. He’s been to Aberystwyth, Aberaeron, met our regular peeps we see around the place. Bumped into the wife of our donor. Just sat on the sofa and held him which is what I’ve been yearning to do for the last couple of months. I want to hold him now but he’s asleep in his basket and I want to encourage him to sleep there as much as possible cause he likes being in your arms too much which isn’t practical at night. We’ve called him Phineas. Phineas Paul. But I call him little podge and on the blog, I’ll call him Snappy. My baby was born in the bath. He is amazing. Unbelievable! Congratulations on your new baby and the delivery!! Nailed it! What a story, but glad to hear all are alright!! Oh, my god, what a story! I’ve been looking forward to reading about it, but wow, incredible! I can’t even imagine the intensity of emotions you both must’ve felt in that bathroom! I’m just so, so happy to hear your little fella and wife are both well now, and home safe and sound. I’m so proud of you, Rhi, it sounds like you handled the rough parts like a total champ, even with the minor freak-outs! It must be just… augh, pure JOY to hold his warm, squishy little bod in your arms and snuggle up. Bliss. Oh.my.gosh. I have had four girls…including twins and this is insane. What an entrance. Your wife is ah-mazing. YOU are amazing. I am sure you were her rock through the whole ordeal. I am so glad you two have that beautiful little man to love. What a lucky little guy and what a story he now has! Now that is a birth story. It sounds like you were a great birthing partner who tried to keep everything calm for your other half, well done! I really enjoyed reading this and a great story to tell your little bundle in the future. Congratulations he’s gorgeous! Really excited when I saw this post on the linky – I was hoping we’d get to hear all about it. Congratulations. That sounds like a proper roller coaster! Glad things are settling down now and you are getting to enjoy some time with your boy. 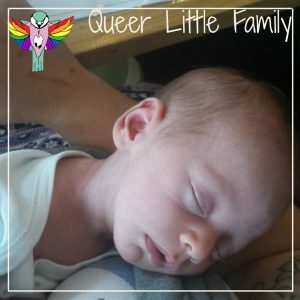 What an amazing birth story and I’m glad that your wife and baby are fine. Your story bring brings back so many lovely memories regarding my first. The Speed Bump recently posted…EasyMat Review & Discount Code: No More Mealtime Madness! Wow, so glad everything turned out fine for everyone involved! An hour before the placenta detached is a LONG time! Congrats to you and yours on your new baby boy! Madeline (This Glorious Life) recently posted…What’s in a name? Congratulations! I am a fellow emergency home birther (though not in bath)! Not quite as dramatic as yours. My first baby was a very quick labour for a first, but was in hospital. My second was under an hour from the very first signs of any labour & the birth was seconds & never made it to hospital. & the eldest witnessed it. The paramedics did arrive just as baby was being born for us though. I had a lot of problems with afterbirth too (now know how great that injection you get in hospital is), & there were no midwives available to attend – the paramedics were starting to panic about what to do when finally managed to deliver afterbirth. Strangely enough, I had unusually little bleeding. With the fact that I was shaking uncontrollably, low blood pressure and dizzy, the paramedics were concerned I was bleeding internally or had some placenta left behind. But as it turns out was just the shock of the birth! Still, once you recover from these things, they are good stories! He is adorable and congratulations. What a story you will be able to tell for years to come but I am sure at the time you were scared out of your mind. Glad mom, baby, and you are all good, happy, safe, and at home. Thank you for sharing with #momsterslink.